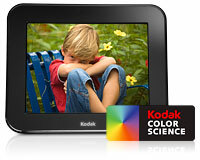 The KODAK PULSE Digital Frame is very cool. Everyone can send pictures right to your frame when you provide them with the link. They just pop up on your screen Adding your own pictures is super easy too ( it needs to be as I’m no technical genius ) you can add them from your phone, facebook or your computer. Utterly brilliant. Daddy at home can see his sons face just as scores on the footabll field right in his living room. It looks classy, has really sharp clear pictures and it’s a lovely, lovely thing to have in your home. It keeps children entertained too. Mine are mesmorised and it updates and changes constantly. 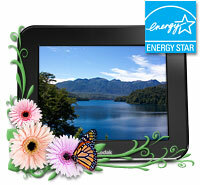 It also has a full touch screen that makes your entire photo-viewing experience easy. You can scroll through, view slideshows, make it faster, make collages, linit the photos you view to being from just one person and so much more. It is so versatile. My children adore looking at themselves and at all their adventures so proudly now on display, not hidden in albums or on the computer. They like to see their baby pictures and ones of mum looking younger! It really does display pictures beautifully. The pictures look amazing on the 17.8 cm (7 in.) high-quality digital photo display (800 × 600 pixels) and apparently this is due to KODAK Color Science and LED backlighting. You can store up to 4,000 pictures and pictures are resized to fit the frame and still look fabulous. There is an extra USB port and 2 monory card slots to add dadditional images from other sources. …and on top of that it’s v green! I wish it could be free standing and didn’t need plugging in but it is absolutely ace and takes pride of place in our living room. We want to get GG (Great Grandma ) one now so she can sit in her comfy chair and see all the kids adventures as they happen. Wouldn’t that be cool.